We’re delighted to be working with Say Sue Me for the first time! 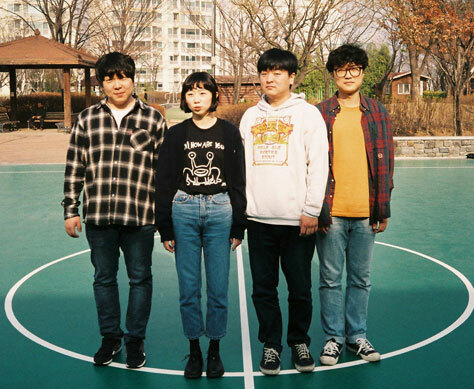 Say Sue Me are a surf-inspired indie-rock/pop act from Busan, South Korea, cited as one of 2018’s ‘break-out bands’. Childhood friends Jaeyoung Ha (Bass) and Byungkyu Kim (guitar) met drummer Semin Kang and played in bands together since 2012, when they met Sumi Choi at a tea shop in Nampo-dong. They liked her speaking voice and immediately offered her a spot as the vocalist in a new band that would become Say Sue Me. Sumi turned out to be a natural at songwriting. Semin sadly suffered trauma from a fall. New drummer Changwon Kim stands in while they await Semin’s recovery. Following showcases at SxSW in 2018, the band released their sophomore album Where We Were Together and a Record Store Day covers EP, which won praise from Pitchfork, NPR, Billboard, i-D, the Independent, Stereogum, Paste, MTV, Uproxx, Fader, DIS, The 405 and more. Three tracks were playlisted on BBC 6 Music where Lauren Laverne, Tom Ravenscroft, Gideon Coe and Don Letts have championed the band, as well as Elton John on Beats1 and KEXP. Support comes from trio Sewage Farm. This show is a co-promotion with Please Please You and the Brudenell.